After a while we couldn't even remember what made us mad in the first place. Its at moments like those when you think, "what am I so mad about," that you can notice the pettiness and do something different. Last week I wrote a post about how to dissolve resentment. I said, "the way in is the way out." I can't take credit for that phrase or its nugget of wisdom, but the point is that you can transcend anger or resentment by being a little curious about it. You just need the courage to step inside of it. The result is that you learn from your anger. You see the world more clearly. You see when anger is justified and when it is just your ego hanging on by a fingernail, like it was for me during today's argument. One way "in" is the practice of tonglen. This is probably the most useful and effective practice I've learned since shamatha meditation. The idea behind tonglen is to dissolve the ego by putting others ahead of yourself. It is a practice in compassion. The ironic part is that when you put others first, life ends up getting better for you too. It's like a virtuous boomerang. Step 1: Start by flashing on bodhichitta (awakened heart). We can think of this as total openness. It has a fearless quality because you are connecting with the feeling in your heart. Most of us are often chicken about feeling what is in our hearts, even if we would enter a burning building to save dogs, kids and old ladies. The feelings in our hears is often raw, tender, ready to jump out of our chest. Some days we may feel totally numb. Either way is OK. Just try to connect to whatever feeling is there. Step 2: Imagine something bad... constricting, depressing darkness. Don't completely flip yourself out, but go as far as you can with this on a generic level, not specific to any situation. I try to imagine what sadness feels like, the way people feel when something painful has happened to them, people who have experienced war, homelessness, loss, etc. After you've done this, air it all out. Touch into the feeling of happiness, sunlight and summer, or whatever works for you. Again, this should be a general felling of good stuff. Step 3: Start the practice of "sending and receiving" by thinking of a specific and painful situation. It can be a situation you experienced, or the experience of someone else. It could be about the fight you had with your spouse, the kid who is having a hard time in school, or the article you read in the Times about someone's suffering in a far-off land. Breathe in the suffering. Experience the pain that this thought brings, the sadness, the despair, or whatever is associated with it. Then breathe out a sense of spaciousness, peace, relaxation, or whatever will ventilate the feeling. Do this over and over for a few minutes. Step 4: Do the same thing as step 3, but this time do it for all sentient beings. You can think of the thing you contemplated in step 3 and consider how suffering is universal. All sentient beings know suffering. In that way we are all the same. Breathe it in and then air it out. These instructions are really meant to go along with a sitting practice. I think it is a good idea to practice this regularly in this extended form, but I've also found it helpful to shorten this practice for use in the midst of a busy day. For example, when I am angry or resentful about something, and I realize it, I will often stop myself and do this practice for a few moments. I find that it helps calm my emotional reaction, and I feel the resentment dissolve as I'm presented with a new way of viewing the world and the difficult personalities I come across. It breaks the patterns of habitual reaction and brings compassion to the situation. Doing this makes life better for me and for those around me. This is a good entry. I saw myself last night get all PO-ed wile driving around and realized, "This usually happens when I get tired and want to rest, but feel like people are keeping me from it." And I also realized it’s dangerous to be less than level-headed while operating a motor vehicle. It did, as you say, allow me to let go very quickly. 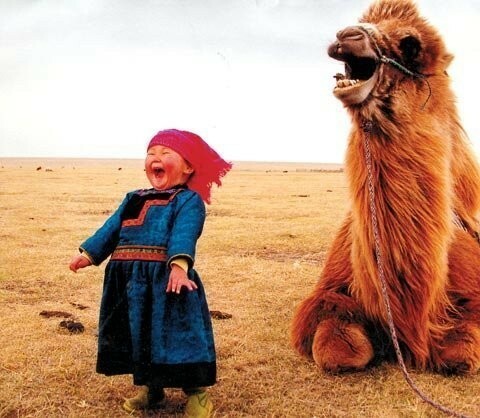 Can I have the picture of the Mongol kid, it is wonderful! thank you for a contemplative moment, you really made ton-glen practical and meaningful to me! Please continue to blog like this, you talk the talk and you walk the walk, very inspiring and helpful.